Now you see them…and soon you won’t! 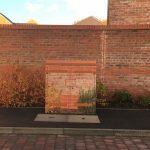 At least that’s the case at an innovative Tees Valley housing development where street cabinets are looking a little different. Wynyard Park has teamed up with graphic design experts at Shutter Media to blend street furniture into its surroundings by wrapping them in a range of clever designs – from brick, rendering and landscaping through to the woodland animals commonly seen on the development. 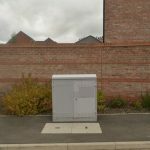 Sixteen Virgin Media street cabinets are to get the wrap treatment – with plans to eventually hide the majority of the development’s street cabinets in plain sight. 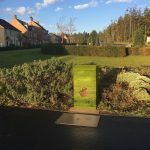 The project was the brainchild of Wynyard Park Development Manager Craig Pinder who teamed up with Steve Hale of Shutter Media to initially lessen the impact of two street cabinets with a deer and stag design. Work is currently underway to wrap a further 14 boxes. Craig said: “I saw an opportunity to add a bit of imagination and colour to some of the cabinets that have to be installed as part of the infrastructure and that’s when we decided to wrap the initial two. “The residents’ garden is a nice, relaxing area adjoining some of our woodland. “We wanted residents and guests to focus on the beauty of the garden rather than the cabinets. The reaction has been so positive that the idea was also picked up in other areas of the country – with Steve’s company, which is based at Durham Tees Valley Airport, wrapping street cabinets in Manchester and London. Wynyard Park and Virgin Media have co-funded the pilot project which may be rolled out to other developments if successful. Steve said: “We were certainly one of the first locations to do this. The vinyl used to wrap the cabinets is the same that Steve uses to decorate shop shutters as it adheres to galvanised steel. Graphics are then printed onto the material with latex and given UVA protection. The wraps have a seven to ten-year lifespan. “Our company started putting images onto shop shutters,” explains Steve, “hence our name Shutter Media. “But we have now used the material for so many different applications. It works on brick walls, we can wrap concrete up and once it’s on, it’s on. For more information about the properties and self-build plots currently available at Wynyard Park please visit http://wynyardpark.com. Street cabinets at Wynyard Park.